Booknotes: Requiem for a Species: Clive Hamilton's new book. 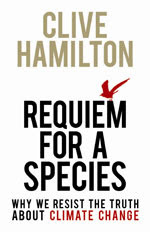 Clive Hamilton's Requiem for a Species is an extremely well-written, passionate and angry treatise on humankind's seeming unwillingness to confront the alarming global warming that threatens our very survival. Hamilton is not so much an alarmist as a catastrophist. He reviews, lucidly, the latest climate change science, and questions what it is that is holding back dramatic and necessary political and economic action by virtually all governments around the world. He slams all sceptics, accusing them of only shameful political agendas. This is a post-Copenhagen book. It takes for granted that CO2 emissions will continue apace, that resolute political action is now far too late and in any case will be insufficient and tokenistic, and that humankind is in for a very rough future as the 21st century unfolds. It's a clear-eyed, terribly depressing portrait, with only small glimmers of hope. I'm not a scientist either, but I've read enough to know that there are plenty of other scientific perspectives on this issue, perspectives that we need to seriously consider before we run off and collectively slash our wrists in despair, or indeed take political and economic actions that are unnecessary and unwise. Hansen's views are essentially based on the physics of CO2 in the atmosphere, a physics that is calculable and formula-based. Effects are measurable. A certain increase in CO2 means a certain global temperature rise; a certain global temperature rise means a certain amount of ice melting; a certain amount of ice melting means a certain amount of sea level rise; a certain amount a sea level rise means a certain amount of havoc to human populations. Etc. All will follow as night follows day. All measurable and therefore predictable. Despite what we are continually led to believe, this 'physical', formulaic atmospheric science has not been universally embraced by the world's climate scientists as the sole or even dominant perspective in the field. It ignores so many other dimensions of the world's climate system - solar cycles, cloud behaviour, ocean dynamics, precipitation patterns, etc. Climate science is a rich, complex and developing field of study, containing much uncertainty and much that is still unknown. There are new climate change books being published virtually on a daily basis. I'm still waiting, however, for the one that nicely brings all perspectives together and offers a well-honed critique of the state of play that can move the debate forward in a calm, measured, rational way. That may be impossible, as it requires a wisdom that far transcends anger. We're a long way from that yet. Anyone familiar with (1) the basic laws of physics and chemistry; (2) climate change observations and measurements around the world over the last 40 years or so; (3) reports by the world's major science research organizations (NASA, NSIDC/Colorado, Hadley, Tyndall, Potsdam, CSIRO, BOM) and (4) the peer review science literature, realizes that dangerous climate change is as well established as, for example, Darwinian evolution, plate tectonic theory, the connection between CFC-ozone destruction, HIV-AIDS or smoking and lung cancer, and that it is a plethora of non-sciece factors, including ideological (man-over-nature, anti-environmentalism), psychological denial and vested interests, which are preventing the world from taking the necessary measures to avoid the worst - 4 degrees C warming, loss of the polar ice and many metres sea level rise.